Colorado Criminal Law – Understanding The Fruit of the Poisonous Tree Doctrine – When one hears the words “fruit of the poisonous tree” in the context of a criminal case, the public, (while perhaps pleased by the sound of the words which sound promising), may not have a comprehensive understanding of how the rule came into being and exactly when, or if, damaging evidence can be excluded from their case through the application of the “fruits” doctrine . This article addresses the fruit of the poisonous tree doctrine as applied through the use of the exclusionary rule. Basically, the rule is this: when an illegal action such as an illegal search and seizure is used by the police to obtain gain any incriminating evidence, that evidence which stemmed from the illegal action – (evidence that is the “fruit of the poisonous tree”) cannot be admitted at trial. Before the year 1914 illegal and warrantless searches conducted by law enforcement went unpunished America. In 1914 the United States Supreme Court decided Weeks v. United States, 232 U.S. 383, 34 S. Ct.341, 58 L. Ed. 652 (1914) and the law changed with the application of the exclusionary rule to illegally obtained evidence. This “Fruits” Rule is essentially an extension of a broader umbrella concept called the exclusionary rule. The exclusionary rule applies to exclude ANY evidence that is illegally obtained and prohibits the use of that evidence in the trial of a Defendant. The Fruits of the Poisonous Tree Doctrine was established to prevent police misconduct, specifically as it relates to violations of the constitutional rights of those accused of crime. The reasoning underlying the rule is that if the tree, (the illegally obtained evidence) is poisoned, so, too, must be the “fruit” of that tree. Again, it is a rule that requires that all evidence derived from the unconstitutional actions of law enforcement be excluded from evidence as well as the original, illegally seized evidence. It is designed to prevent abusive, eager-beaver policemen from trampling Fourth Amendment protections. The unusual term of fruit of the poisonous tree was coined by Justice Frankfurter in 1939. The exclusionary rule is a rule of law which is grounded on constitutional law. As noted the larger rule precludes ALL evidence collected or analyzed in violation of a Defendant’s constitutional rights from being used in a court of law and therefore the constitutional history of the rule is extremely relevant. The history of the exclusionary rule establishes that the rule was and is intended to be “prophylactic” – meaning it is intended to prevent violations of an accused’s constitutional rights. Those constitutional rights stem from the Bill of Rights and the application of the rule to those rights protects citizens from the Government’s unlawful actions. The exclusionary rule is powerful. It not only applies to specific pieces of evidence, it applies to illegal arrests, illegal wiretapping, and illegal interrogations. Any and ALL evidence gathered through questionable or outright illegal means cannot be used against a Defendant. The Fourth Amendment is essentially the most important components of your right to privacy. The rights afforded by the Fourth Amendment are fundamental to our democracy and are under constant threat from the Governmental interest in “efficient” law enforcement. The “fruit of the poisonous tree” doctrine puts a check on illegal conduct by the police by limiting or foreclosing the use and admissibility of that Governmental evidence that has been gained through an illegal search or seizure. The Fifth Amendment is another key component to the right to privacy. The Fifth Amendment protects a person from being “compelled in any criminal case to be a witness against himself.” The right to be free from self-incrimination is critical to the individual’s protection from the State’s interest in a successful prosecution at all costs. The Fifth Amendment seeks to protect the truth seeking function of the courts. The Miranda decision is the case all of us reflect upon when we think of the Fifth Amendment. After the Miranda decision, the police must give a warning to a suspected criminal Defendant of their right to remain silent. The “Miranda warnings” alert a suspected criminal defendant not only of his or her right to remain silent and to the fact that anything he says can be used against him ( the protections of the Fifth Amendment) but the warning also alerts him or her to the constitutional right to consult with an attorney and to have an attorney present during questioning (the Sixth Amendment). Furthermore, he Miranda rule requires that once an accused has invoked his right to have counsel present during custodial interrogation, law enforcement must stop ALL questioning at the point of invocation. “[i]n all criminal prosecutions, the accused shall enjoy the right…to have the assistance of counsel for his defense. Like the Fourth and Fifth Amendment, the remedy for a violation of the Sixth Amendment’s right to a lawyer (depending on the facts of course) is the exclusion from evidence of statements obtained unlawfully. However the basis for the application of the Sixth Amendment’s exclusionary rule is directed more to the right to a fair trial and less to deter illegal police conduct. A Motion To Suppress Evidence is the proper vehicle at a pretrial hearing called a Motions Hearing to challenge unlawfully obtained evidence. In Colorado drug crime cases the most common example of the application of the “fruits” doctrine is the classic illegal search of a vehicle or a person following a simple traffic stop. If a Colorado law enforcement officer stops your car for a traffic violation and he or she does NOT have probable cause to search your car, an illegal search of that car and the discovery of controlled substances is unlawful under the Fourth Amendment. The Government is NOT allowed to later use that unlawfully obtained evidence at a trial on charges of the Unlawful Possession of Controlled Substances. At the Motion To Suppress Evidence hearing the defense lawyer would demand the Trial Judge invoke the exclusionary rule and suppress illegally seized drugs. A Judge not a jury makes this decision. In Colorado, the Defendant has the initial burden of showing that his proving constitutional rights were violated. If the Trial Judge decides the seizure of the evidence was illegal, and the seizure did not fall into one of the FOUR recognized exceptions (see below) the exclusionary rule requires that the evidence will be suppressed in the pending case. This is where it becomes a little confusing. A Trial Judge only has the authority to suppress the evidence illegally seized and NOT to dismiss the case. If, after application of the exclusionary rule there remains OTHER EVIDENCE from another source, the District Attorney has the right to proceed to trial on that evidence. Finally, if a Trial Judge grants a Motion to Suppress, the DA has the right, under certain circumstances, to immediately appeal that decision in an expedited proceeding that challenges the Trial Judge’s decision before the case goes to trial. In the Fifth Amendment context, the exclusionary or “fruits” rule applies, if a person is in custody (under arrest or detained unlawfully) and the police question that person after the person demands the right to a lawyer. When the police fail to scrupulously honor the right to “lawyer up,” ignoring the suspects request for lawyer and continue their questioning any incriminating statements, such as a confession, is tainted or “poisoned” and those statements must be suppressed. Over many years courts of appeal around the country have developed exceptions to what many believe are the harsh impacts of excluding key evidence in criminal cases. As a result four primary exceptions to the exclusionary rule have evolved. Therefore, even when evidence is obtained illegally by the police, a Colorado Trial Judge may still admit the evidence at trial under one or more of the following four main exceptions. I. The Inevitable Discovery Exception. III. The Independent Evidence Exception. IV. The Good Faith Exception. I. The Inevitable Discovery Exception. The rationale behind this exception is that the subject evidence obtained illegally would have been discovered anyway, even without the tainted source. II. The Attenuation Exception. More complex than the inevitable discovery exception, under the attenuation exception the Government must establish that the subject evidence was discovered as a result of an untainted, admissible source. Essentially attenuation means that the method used to for obtain the subject evidence has become so far removed from the illegal seizure that it “becomes” admissible. Under this exception, the link between the illegal search and seizure and the subject evidence is essentially broken. This is true even if the illegal search set in motion a chain of events that led to evidence that is ultimately revealed. The causal relationship between the primary constitutional illegality and the evidence obtained is so attenuated as to purge the latter of the taint. III. The Independent Evidence Exception. Again, a relatively simple exception. If the subject evidence is first discovered illegally but then legally discovered later, it is admissible at trial. The Government must prove that the subject evidence was discovered by a source that was wholly independent of the illegality. The focus then is on the warrant and on the actions of the police. There are several ways to defeat the State’s attempt to admit evidence under the Good Faith Exception. First: The Judge who signed and issued the warrant cannot have been mislead by the “affiant” (the police officer requesting the warrant). Therefore, if the affiant knew the information that was provided in the warrant was false or he should have know the information was false and acted in in reckless disregard of the truth, the good faith exception can be defeated. Second: If the Judge who signed and issued the warrant abandoned her or his role as a judge or magistrate, the good faith exception can be defeated. Third: If the warrant itself was “so lacking in indicia of probable cause as to render belief in its existence entirely unreasonable” or “so facially deficient” that the officers executing the warrant could not have reasonably presumed it to be valid, the exception will again fail. There is no question that the Fruit of the Poisonous Tree Doctrine is controversial. 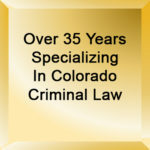 It is a powerful weapon in the arsenal of the Colorado criminal defense lawyer and it is used by the defense to defeat the government in cases where a jury might convict had the evidence in question not been obtained illegally. Having said that the intent of the rule is to protect all citizens from illegal government activity and is an attempt to balance the competing policy interests of protecting Colorado’s citizens from crime, and protecting those same citizens from the illegal actions of law enforcement. H. Michael works hard to get his clients the best possible results in and out of the courtroom. 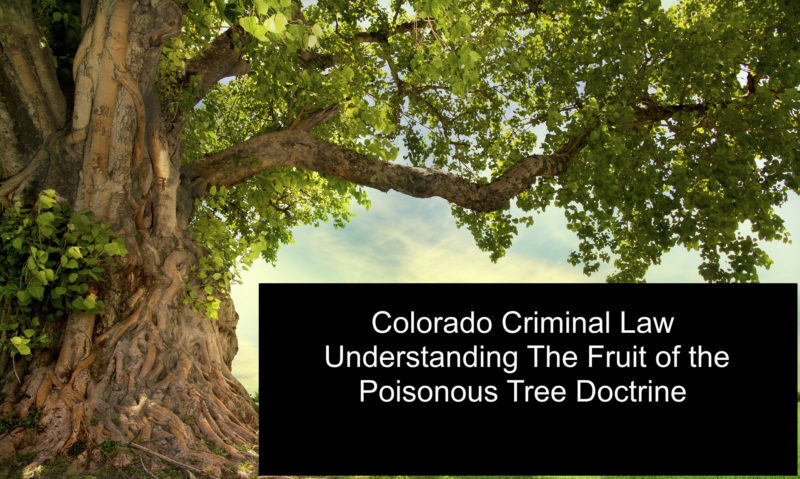 He has written, and continues to write, extensively on Colorado criminal law and he hopes this article helps you in some small way – Colorado Criminal Law – Understanding The Fruit of the Poisonous Tree Doctrine. When one hears the words "fruit of the poisonous tree" in the context of a criminal case, the public, (while perhaps pleased by the sound of the words which sound promising), may not have a comprehensive understanding of how the rule came into being and exactly when, or if, damaging evidence can be excluded from their case through the application of the "fruits" doctrine .